Jun 18, 2013 - ment stages and are ideal ecosystems to study the interaction of bacteria, fungi .... phosphorus (P) cycling in the forefield of the Damma Glacier. Mar 7, 2006 - time as one year in laboratory experiments, at room temperature and with high nutrition ..... face of the glass grains (Fig. 5A). ..... ocean floor basalt, Earth Planet. Sci. Lett. .... The error bars shows the experimental error. 300 . Jul 23, 2018 - A dihydropteroate synthase. (DHPS) catalyzes the condensation of 2-amino-4-hydroxy-6- hydroxymethyldihydropterin diphosphate with pABA,. and Sapropelite Kerogen in Sediments of Thermal. Carbonic Waters in the Baikal Rift Zone. A. V. Tatarinov, L. I. Yalovik, E. V. Danilova, and Z. B. Namsaraev. Feb 8, 2001 - Mangrove ecosystems cover roughly 60â75% of the world's tropical and ... The Center for Biological Research of the Northwest (CIB),. P.O. Box 128, La Paz, Baja ... The role of mangroves in sustaining the diversity of. Mar 15, 2010 - 37. Walton Smith, F. G. 1939. Sponge mortality at British Honduras. Nature. 143:785. 38. Webster, N. S. 2007. Sponge disease: a global threat? Mar 16, 2009 - Seasonality. Lateral. Vertical. Mixed layer Sea ice resolution levels thickness forcing mixing diffusivity scheme. (Lon Ã Lat). (m). 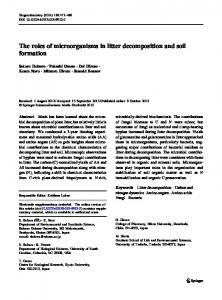 (cmâ2 sâ1)c.
Much has been learned about the microbial decomposition of plant litter, but relatively little is known about microbial contributions to litter and soil chemistry. Oct 23, 2012 - 649, 1999. Cai, W. J., Luther, G. W., Cornwell, J. C., and Giblin, A. E.: Car- .... Soetaert, K., Petzoldt, T., and Meysman, F. J. R.: Marelac: Tools for. Jun 5, 2012 - trations over as little as a tenth of a second, ... vide insight into how the flows of trace gases ... revealed a number of new insights on the. (acceptor) was studied in various rigid glasses at 77 K. It is shown that energy transfer is much more efficient ... cyclohexane/n-pentane is opaque, and the phos-. Nov 17, 2016 - The main concern of the present review is also to explore the role of microorganisms in ..... niger and Pleurotus florida for decolorization of distillery effluent using agricultural ..... Enzyme Microb Tech 29: 246-251. 47. Kumar P ..
Mar 26, 2007 - organisms in coral health and disease has been the primary driving force ... connected to a large, porous calcium carbonate skeleton. (FIG. 1). The ISME Journal advance online publication, 13 November 2008; doi:10.1038/ismej.2008.104. Keywords: coral ... Correspondence: E Rosenberg, Department of Molecular Micro- ..... Rohwer F, Seguritan V, Azam F, Knowlton N. (2002). Nov 11, 2011 - ically those of lodgers), aims to: (a) identify consumers' expected outcomes with respect to staying at a green hotel; and (b) test the relation-. Biogeosciences, 10, 6115–6130, 2013 www.biogeosciences.net/10/6115/2013/ doi:10.5194/bg-10-6115-2013 © Author(s) 2013. CC Attribution 3.0 License. negative δ 13 C excursions. The microscale biogeochemical processes imply that microbial activity has only negligible effects on the bulk δ 13 C signature in speleothems, which is more strongly affected by CO2 degassing and the host rock signature. fabric (Jones, 2010). Constructive processes include microbe calcification, trapping and binding by filamentous microbes, and/or mineral precipitation (Cañaveras et al., 2001; Jones, 2001). Destructive processes include microbially influenced corrosion or dissolution of mineral surfaces that can occur through mechanical attack, secretion of exoenzymes, organic and mineral acids (e.g., sulfuric acid), and a variety of other mechanisms (for a summary please refer to Sand, 1997). Of particular interest in cave dissolution processes are reactions involving iron-, sulfur-, and manganese-oxidizing bacteria (Northup and Lavoie, 2001). Iron oxides and hydroxides are most often observed as coatings or crusts and as powder on clastic cave walls, but they also exist as typical speleothems such as stalactites (e.g., Caldwell and Caldwell, 1980; Jones and Motyka, 1987). Several descriptive studies have established the association of bacteria with iron deposits in caves, but experimental evidence for an active microbial role in the formation of iron deposits in caves is still lacking (Northup and Lavoie, 2001). With regard to flora and fauna, caves are usually divided into two segments: (i) a twilight zone and (ii) an aphotic zone characterized by no light and few microbes (Jones, 2010). In this study we focus on a stalactite found in the aphotic zone. The sample contains mainly calcite and ferromanganese oxides, which is unusual in this continental setting as they are widely encountered in warm environments (e.g., Spilde et al., 2005). The presence of microbes does not automatically imply that they played a role in the formation of the surrounding minerals, because they may simply have been buried during mineral precipitation (Polyak and Cokendolpher, 1992; Forti, 2001). Assessment of the exact role that the microbes played in the mineral precipitation is usually considered impossible to make (Jones, 2010). However, by combining microscopical and geochemical evidence at a high spatial resolution, we aim to constrain precisely the role of microbes in stalactite formation in this cave. Calcite δ 13 C has been interpreted as reflecting surface vegetation changes (C3 vs. C4: Brook et al., 1990; Dorale et al., 1992; Bar-Matthews et al., 1997; Hou et al., 2003; Denniston et al., 2007), although more recent studies point to cave air ventilation as a major influence (Tremaine et al., 2011). It has been demonstrated that degassing of CO2 from the dripwater controls the rate of calcite precipitation (Mickler et al., 2004; Spötl et al., 2005; Bourges et al., 2006; Baldini et al., 2008; Kowalczk and Froelich, 2010), as well as the isotopic composition of dripwater and subsequent calcite (Mattey et al., 2008; Mühlinghaus et al. 2007, 2009; Oster et al., 2010; Frisia et al., 2011; Lambert and Aharon, 2011). These studies show that – if carefully evaluated – δ 13 C can be used as a paleoclimatic indicator. However, the potential impact of microbial activity on carbon isotope fractionation is usually overlooked in paleoclimate studies. We aim to investigate this impact in detail in the current work. Fig. 1. Map of Siberia, showing the location of Botovskaya Cave. Fig. 2. Location of the drilling trench of the stalactite from Botovskaya Cave at Layer B (upper arrow), where the sample for UTh dating was taken. Note the asymmetric distribution of ferromanganese oxides in the stalactite. At least 2 hiatuses (marked by arrows) divide between Layer B and Hiatus D-E, where the youngest microbial presence can be seen as a thin dark-colored layer. of a ca. 15 mm-thick white calcite core, surrounded by asymetric dark brown-black layers of a total thickness of 10– 16 mm, which then give place to another white calcite layer of ca. 10 mm thickness (Fig. 2). The change from the white core to the dark layers is abrupt, with a precursory event that deposited a brown ring about 2 mm closer to the stalactite’s center. The dark layers are compact on one side, but are intercalated with white calcite on the opposite side, where the dark rings fade until they are interrupted. The dark-colored crusts display corrosion surfaces, as they are characterized by an irregular surface topography. The alternating white and dark layers show asymmetric stalactite growth that is likely the result of preferential water flow down one side. An asymmetric growth due to cave wind is unlikely because multiple expeditions at different seasons never observed any cave air current in this (as well as many other) sections of Botovskaya Cave. The latter is most likely due to the location of the stalactite more than 1 km from the nearest opening and in eliminating any possibility of significant air flows (Supplement Fig. 1). The shallow passages also prohibit the development of vertical airflow, as passages most often have dimensions of 30–100 cm in width and 40–200 cm in height. Dripwater was collected in February 2011 close to stalactite SB-p6915 in Botovskaya Cave. The samples were collected using sterilized glass bottles and plastic tubes, and were stored refrigerated and maintained at 4 ◦ C until shipping to ETH Zurich. uate the role that EPS may play in precipitating iron oxides under controlled laboratory conditions. The liquid medium was prepared as follows: 0.5 g Fe(NH4 )2 (SO4 )2 × 6H2 O and 10 mg FeCl3 × 6H2 O were added to one liter of 0.2 µm filtered dripwater from the stalactite. Erlenmeyer flasks containing 100 mL of the liquid were inoculated with biofilms (mm-scale thickness). Abiotic “blank” samples containing only the liquid medium were prepared as controls. Plastic push caps were placed on top of each test tube to prevent contamination and minimize evaporation. Cultures and controls were incubated at room temperature in the presence of sunlight for three weeks. Biofilms were examined using transmitted light microscopy to determine the presence of precipitates. Samples of biofilms and secondary mineral precipitates were collected using a sterile spatula and examined using SEM. Precipitates were collected and analyzed for their mineralogical composition using XRD. Figure 3, Pacton et al. Fig. 3. Secondary electron images of the surface of the stalactite: (a, c) the contacts between layers show the terminations of columnar crystals characterized by cavities and irregular crystals; (d, f) irregular small calcite crystals are covered by EPS-like structures showing sheet morphologies (arrows). Fig. 4. Elemental analyses using EDAX in the SEM area (Fig. 9f): (a) organic composition of the biofilm as shown by the high C peak; (b) surrounding calcite; (c) biofilm is locally permineralized as MgSi-O. Fig. 5. Secondary electron images of the surface of the stalactite: (a–c) dissolution features (arrows) of the small calcite rhombs close to columnar calcite; (d) they are sometimes covered by a film; (e, f) elemental analyses of this film show that it is composed of aluminosilicates on the top of calcite rhombs. analysis. The thickly laminated, columnar calcite crystals have SIMS δ 13 C values between −1.27 ‰ and +1.06 ‰, which are in the same range as obtained by the isotope ratio mass spectrometry (IRMS) (−2.3 ‰ to +2.2 ‰), and observed in several other stalagmites from Botovskaya Cave (Supplement Table 1, Breitenbach, 2004). The contacts at the different cracks, which are characterized by thinner layers, display very negative SIMS δ 13 C values ranging from −5.27 to −13.19 ‰ (Fig. 8 and Supplement Figs. 2–3). This strong depletion is not found in the IRMS data, where δ 13 C values remain in the range from 0 to −2 ‰ (Fig. 9). The crack however is visible as carbon and oxygen shifts towards more negative values. The IRMS δ 13 C decrease has to be relativized, since shifts of this magnitude occur throughout the analyzed section. SIMS δ 18 O also reflects a ca. three permil depletion of −11.9 to −15 ‰ around the crack, while this is less significant in the IRMS δ 18 O data: here less depleted (1.5 to 2 ‰ compared to before the crack) values are observed. Over the entire IRMS profile, δ 18 O varies from −12 to −14.5 ‰ (Fig. 9). Figure 6, Pacton et al. Fig. 6. Secondary electron images of the calcite rhombs in the cavities: (a–d) microbes are widely distributed as filaments (black arrow) and EPS (white arrows). (e) Smaller rhoms are locally covered by a thin biofilm; (f) elemental analysis of the biofilm showing that it is made of low-magnesium calcite. Fig. 7. XRD analyses of various zones of stalactite show that (a) the thick and thin layers consist mainly of calcite, and that (b) dark-brown crusts are amorphous as calcite is the only mineral present in the diffractogramm. Figure 8, Pacton et al. Fig. 8. Microphotographs of segments of stalactite sample after ionprobing. δ 13 C measurements indicate more negative values in the cavities, as shown by the SEM picture. and O, thus identifying them as iron oxides. XRD analysis of these precipitates verified them to be amorphous. While iron-oxide crystal aggregates are present in the abiotic cave water control, no rosettes have been observed (Fig. 15b). Fig. 9. Profile of δ 13 C and δ 18 O variations with depth in stalactite 2-N obtained by micro-drilling and conventional acid dissolution analysis. The grey area corresponds to a crack. permineralized am Mg-Si phases (Sanz-Montero et al., 2008; Pacton et al., 2012). Many of the biofilms found throughout the stalactite commonly cover the surfaces of block-like calcite crystals. Therefore, biofilms seem to help initiate layer formation on the stalactite via organomineralization processes characterized by small calcite crystals. Subsequently, abiotic calcite precipitation leads to the formation of thicker columnar calcite crystals. The latter may be further colonized by endolithic microborers, as suggested by the coccoid shapes in the studied sample. These could be similar to endolithic microborings produced by algae and some cyanobacteria (Harris et al., 1979). Despite the fact that only a few taxa are found in the twilight zone of the cave, these microborers may be Geitleria calcarea, Loriella osteophila or other bacteria (Jones, 2010). While there is no evidence of trapping and binding or filament encrustation, this study gives further evidence of microbes indirectly influencing precipitation in a Pleistocene stalactite. Fig. 10. Secondary electron images of the dark-brown crusts: (a) iron oxides are located in the depressions within calcite crystals; (b, c) globular structures with a size ranging from a few microns to 20 |mum; (d, e) spherical bodies are composed of acicular needles that have a radial arrangement. They display a close association with EPS (arrows), as the needles are within or below EPS; (f) elemental analysis showing that Fe and O are the main components of these crusts and are associated with a small contribution of Mg and Si. Fig. 11. Secondary electron images of the surface of the stalactite: (a) a thin layer cover calcite surface that includes microborings (arrows). They consist of solitary cells that are spherical in shape and average 1 to 10 µm in diameter; (b) microborings include open borings (1) and resin casts (2); (c, d) elemental analyses indicate that open borings are made of low-magnesium calcite, whereas resin casts are made of Fe, O and Si; (e) the thin layer-covering calcite crystals are composed of nanofilaments forming flakes; (f) elemental analyses of this layer reveal that it is made of Fe, Si and Mn. romanganese deposits in caves are usually considered an end-product of microbially assisted dissolution and leaching of the underlying host carbonate, and of the enrichment of iron and manganese through microbial oxidation (Northrup et al., 2000, 2003; Boston et al., 2001). Ferric iron is essentially insoluble at neutral pH, and amorphous Fe(III) oxide is the predominant form of Fe(III) reduced in these environments (Murray, 1979; Schwertmann and Taylor, 1977). Fe(II) and Mn(II) may have been released into the cave environment by iron- and manganese-oxidizing bacteria (Northup et al., 2000). Biotic oxidation of metals can occur either indirectly or directly. Indirect oxidation results from the release of oxidants, acids, or bases into the environment surrounding the microbial cell, and leads to a change in redox conditions in the surrounding microenvironment (for a review see Tebo et al., 1997). Direct oxidation may occur through the binding of ion metal to negatively charged substances on the bacterial cell surface, or through the action of metal-binding proteins that are both intra- and extracellular (Ghiorse, 1984). Fig. 13. Secondary electron images of the relationships between dark-brown crusts and calcite crystals: (a, b) partial dissolution of calcite rhomboedra as shown by the porous texture (black square); (c, d) irregular outlines of calcite rhombs (white arrows) closely associated with microorganisms (black arrows). Figure 12, Pacton et al. Fig. 12. Secondary electron images of the corrosion features: (a, b) calcite crystals corroded by iron oxides close to depressions, as shown by irregular outlines; (c) iron oxides characterized by fibrous radial structures (arrows), which are intermixed with EPS (dashed arrows); (d) the contact between calcite crystal and these crusts shows corrosion features (arrow); (e) where this cover is thin, microborings are still visible (arrows); (f) iron oxides are composed of randomly arranged nanofilaments. Fig. 14. Secondary electron images of the ferromanganese crusts covering microborings in calcite: (a) microborings made of tunnels; (b, c) part of tunnels covered by an alveolar network; (d) particule displaying a crenulated surface structure; (e) elemental analysis of the alveolar network mainly composed of low-magnesium calcite; (f) elemental analysis of the manganese oxide particle. Fig. 15. Secondary electron images of the ferromanganese crusts: (a) the biofilm inoculated in the iron-rich medium. Note that 1 µmwide rosettes showing a crenulated surface (black arrows) are closely related to extracellular polymeric substances (white arrows). (b) Detail of amorphous iron oxides in the sterile iron-rich medium appearing as nanoglobules. (c) Elemental analyses of the rosettes (a) indicating a strong contribution of magnesium in the iron oxides. crusts into even older periods, from Middle Pleistocene to Pliocene. 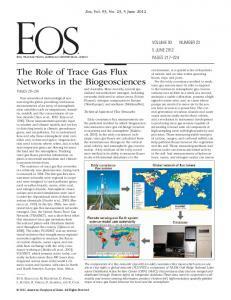 Supplementary material related to this article is available online at http://www.biogeosciences.net/10/ 6115/2013/bg-10-6115-2013-supplement.zip. References Baldini, J., McDermott, F., Hoffmann, D., Richards, D., and Clipson, N.: Very high-frequency and seasonal cave atmosphere PCO2 variability: implications for stalagmite growth and oxygen isotope-based paleoclimate records, Earth Planet. Sci. Lett., 272, 118–129, 2008. Bar-Matthews, M., Ayalon, A., and Kaufman, A.: Late Quaternary paleoclimate in the eastern Mediterranean region from stable isotope analysis of speleothems at Soreq Cave, Israel, Quatern. Res., 47, 155–168, 1997. Barton, H. A. and Northup, D. E.: Geomicobiology in cave environments: past, current and future perspectives, Journal of Cave and Karst Studies, 69, 163–178, 2007. Barton, H. A., Spear, J. R., and Pace, N. R.: Microbial life in the underworld: biogenicity in secondary mineral formations, Geomicrobiol. J., 18, 359–368, 2001. Baskar, S., Baskar, R., Mauclaire, L., and McKenzie, J. A.: Role of microbial community in stalctite formation, Sahastradhara caves, Dehradun, India, Current Science, 88, 1305–1308, 2005. Baskar, S., Baskar, R., Mauclaire, L., and McKenzie, J. A.: Microbially induced calcite precipitation by culture experiments – possible origin for stalactites in Sahastradhara, Dehradun, India, Current Science, 90, 58–64, 2006. Baskar, S., Baskar, R., and Kaushik, A.: Evidences for microbial involvement in the genesis of speleothem carbonates, Borra Caves, Visakhapatnam, India, Current Science, 92, 350–355, 2007. Baskar, S., Baskar, R., Lee, N., and Theophilus, P. K.: Speleothems from Mawsmai and Krem Phyllut caves, Meghalaya, India: some evidences on biogenic activities, Environ. Geol., 57, 1169–1186, 2009. Boston, P. J., Spilde, M. N., Northup, D. E., Melim, L. A., Soroka, D. S., Kleina, L. G., Lavoie, K. H., Hose, L. D., Mallory, L. A., Dahm, C. N., Crossey, L. J., and Schelble, R. T.: Cave biosignatures suites: Microbes, minerals, and Mars, Astrobiol. J., 1, 25–55, 2001.
tions in Guadalupe (NM) Caves, J. Cave Karst Studies, 62, 80– 90, 2000. Odintsev M. M. and Serikov A. P.: Industrial perspectives of the Lensk copper sandstone deposits. Essay on the geology and raw materials in Eastern Siberia, Irkutsk, Irkutsk Oblastnoe Isdatel’stvo, 26–28, 1947 (in Russian). Onac, B. P.: Mineralogy of speleothems from caves in the Padurea Craiului Mountains (Romania), and their palaeoclimatic significance, Cave Karst Sci., 23, 109–124, 1996. Oster, J., Montanez, I., Guilderson, T., Sharp, W., and Banner, J.: Modeling speleothem δ 13 C variability in a central Sierra Nevada cave using 14 C and 87 Sr/86 Sr, Geochim. Cosmochim. Acta, 74, 5228–5242, 2010. Pacton, M., Ariztegui, D., Wacey, D., Kilburn, M. R., Rollion-Bard, C., Farah, R., and Vasconcelos, C.: Going nano: a new step towards understanding the processes governing freshwater ooid formation, Geology, 40, 547–550, 2012. Paull, C. K., Neumann, A. C., Bebout, B., Zabielski, V., and Showers, W.: Growth rate and stable isotopic character of modern stromatolites from San Salvados, Bahamas, Palaeoecology, 95, 335– 344, 1992. Peck, S. B.: Bacterial deposition of iron and manganese oxides in North American caves, Natil. Speleol. Soc. Bull., 48, 26–30, 1986. Pellerin, A., Lacelle, D., Fortin, D., Clark, I. D., and Lauriol, B.: Microbial diversity in endostromatolites (cf. fissure calcretes) and in the surrounding permafrost landscape, Haughton impact structure region, Devon Island, Canada, Astrobiology, 9, 807–822, 2009. Petryshyn, V. A., Corsetti, F. A., Berelson, W. M., Beaumont, W., and Lund, S. P.: Stromatolite lamination frequency, Walker Lake, Nevada: Implications for stromatolites as biosignatures, Geology, 40, 499–502, 2012. Polyak, V. J. and Cokendolpher, J. C.: Recovery of microfossils from carbonate speleothems, Natl. Speleolog. Soc. Bull., 54, 66– 68, 1992. Polyak, V. J. and Cokendolpher, J. C.: Recovery of microfossils from carbonate speleothems, NSS Bull., 54, 66–68, 1992. Rollion-Bard, C. and Marin-Carbonne, J.: Determination of SIMS matrix effects on oxygen isotopic compositions in carbonates, J. Analyt. Atom. Spectrom., 26, 1285–1289, 2011. Rollion-Bard, C., Mangin, D., and Champenois, M.: Development and application of oxygen and carbon isotopic measurements of biogenic carbonates by ion microprobe, Geostandards Geoanalyt. Res., 31, 39–50, 2007. Rossi, C., Lozano, R. P., Isanta, N., and Hellstrom, J.: Manganese stromatolites in caves: El Soplao (Cantabria, Spain), Geology, 38, 1119–1122, 2010. 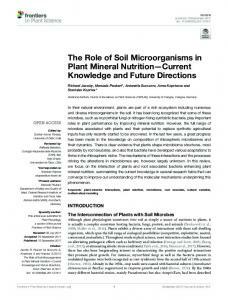 Report "The role of microorganisms in the formation of a ... - Biogeosciences"